"'When our children were little, my husband frequently worked late,' recalls Michelle McWilliams of Fort Lupton, Colorado. 'This eye-catching stir-fry was a satisfying alternative to a big dinner for me and the kids.'" 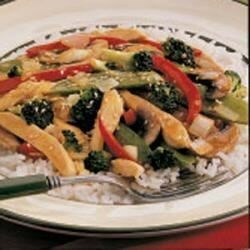 In a skillet or wok, stir-fry chicken in oil for 6-8 minutes or until juices run clear. Remove chicken and set aside. In the same skillet, stir-fry peas, broccoli and red pepper for 2-3 minutes. Add mushrooms and onion; stir-fry for 3-4 minutes. Combine cornstarch and sugar; stir in water and soy sauce until smooth. Add to the pan. Bring to a boil; cook and stir for 1-2 minutes or until thickened. Return chicken to the pan; cook until mixture is heated through and vegetables are tender. Serve over rice. Sprinkle with sesame seeds. I love this recipe to bits! I didn't use the peas or broccoli as I'm not a fan. It was so easy and it tasted great! I wil defintiely use this recipe again. This was a quick mid week recipe. I used julienne cut red and green peppers and carrots, red onion and snow peas. I also added a bit more soy sauce (used light).